Yesterday I showed you how to use THE Dream Machine 2 to make the Improv Pumpkin Patch Wallhanging complete with embroidered jack-o-lanterns. Now it’s time to make a label for the wallhanging. 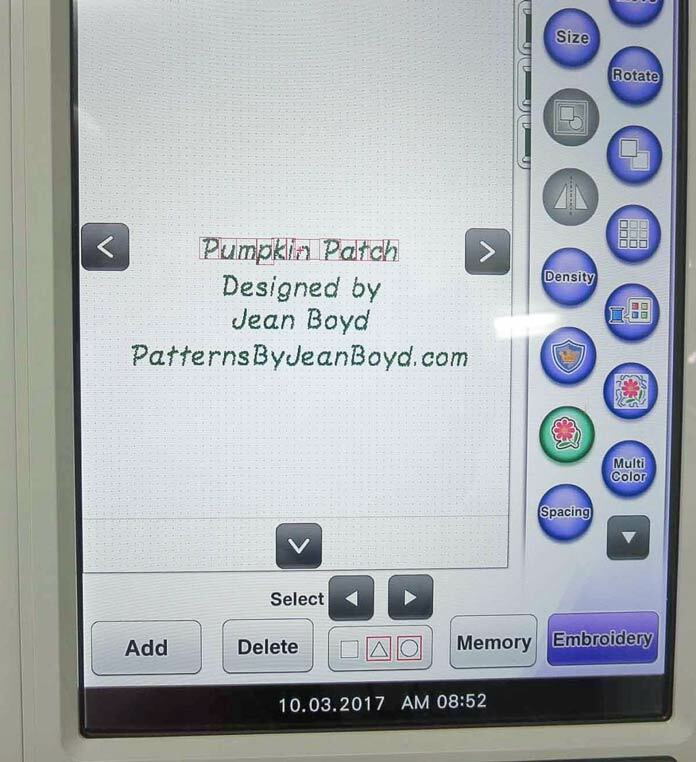 We all know how important it is to make labels for all of our quilting projects and it’s so easy to do using THE Dream Machine 2. 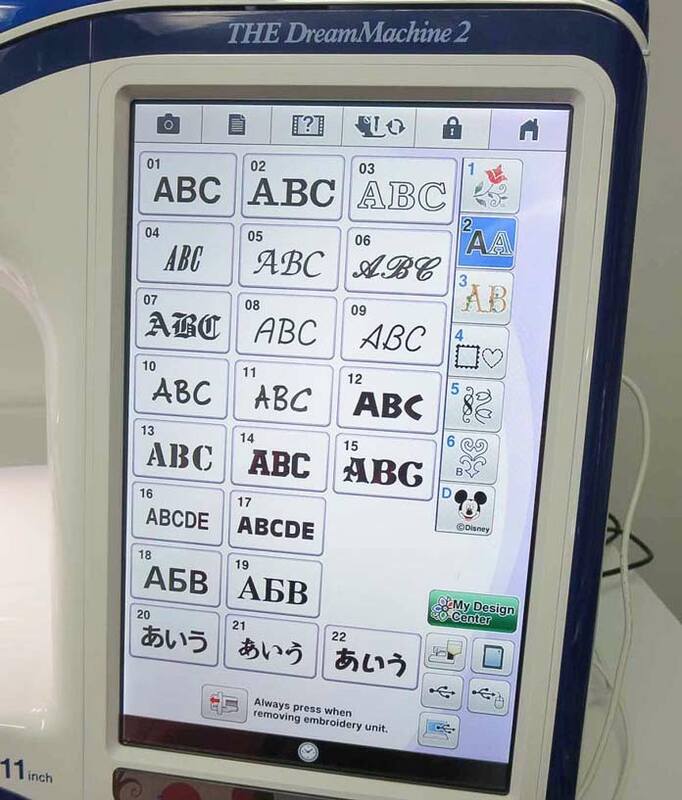 This machine comes with 22 different embroidery lettering fonts and 5 different sewing machine fonts. Really, you’ll find yourself playing with the fonts, font size and layouts, color and letter edit and possibly loose track of time, but in the end you’ll find it was fun to explore the built-in options. Be sure to watch my video at the end of this post to show you how this machine scans your own handwriting then embroiders your handwritten message on a quilt you want to take from really nice to super special. Label design with color added. Select your text, press the desired color button and it’s done! Choose your font and then, using your finger or the stylus on the letters, enter the text you want and it appears on the LCD screen. Then you have several options. By pressing the “edit” button, you can rotate the text, make it larger or smaller, color the text etc. Make sure to touch the little down arrow at the bottom of the edit screen – that brings up even more options including array, font type and letter edit. Text has been entered for the embroidered quilt label. 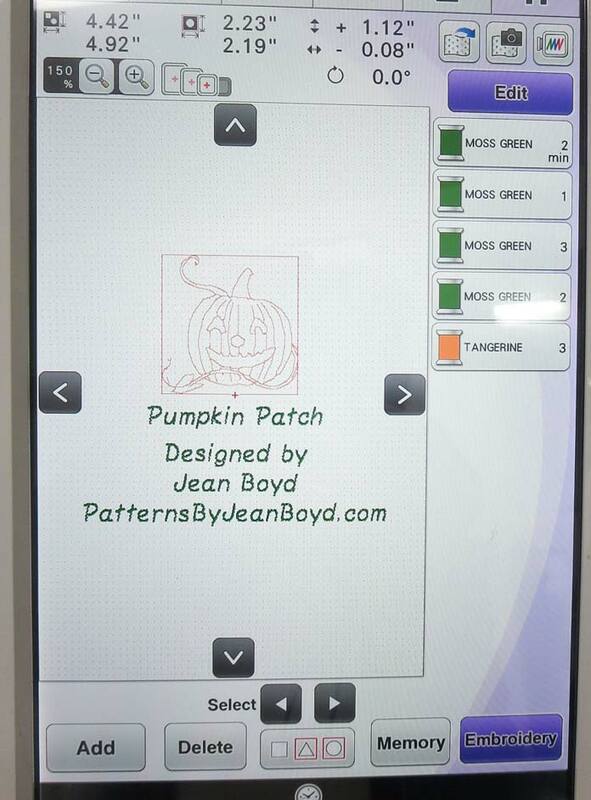 By pressing the “Add” button at the bottom of the screen, I could add one of my saved pumpkin designs to the label. Now the LCD screen shows the size of the label and the colors that will be stitched. By pressing the “edit” button, you can access even more options for changing the size, color, position of the design etc. The “array” button is fun to use – it allows you to curve the text or put it on a slant. If you want your text in different colors, just press the color button which brings up the color pallet. Touch the color you want, touch the text on the screen and it’s colored. How easy is that! You can also add other designs to your text. Press the “add” button and the design library appears on the screen. You can choose a design from the built-in library, one that you’ve saved in your own design library on the machine or choose one that you have saved on a USB stick. 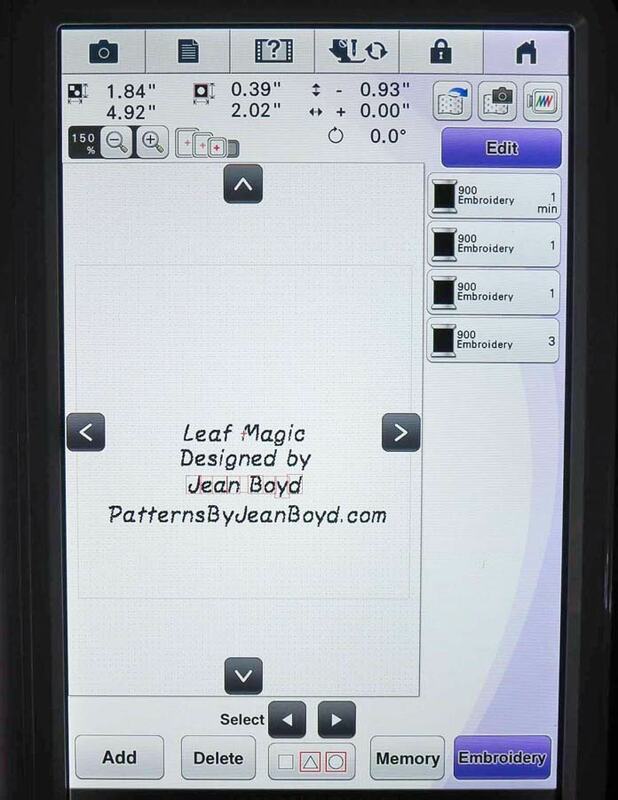 Here’s a label that I designed for my Leaf Magic quilt. Here’s how the label looks after adding color. Just press the color you want from the color menu, press the letters on the screen and your text is colored! Touch the desired color at the bottom of the screen and then touch the letters on the screen to color the text. Here’s how the label looks after I pressed the “array” button on the LCD screen. Label design has been changed by using the “array” button on the edit screen. Use the down arrow at the bottom of the edit screen to find the “array” menu. Don’t forget to save your label design as you’re working on it – just press the “memory” button and the design is saved. I like to save my design at various stages of the design process. You can always go back later and delete the designs that you don’t need. 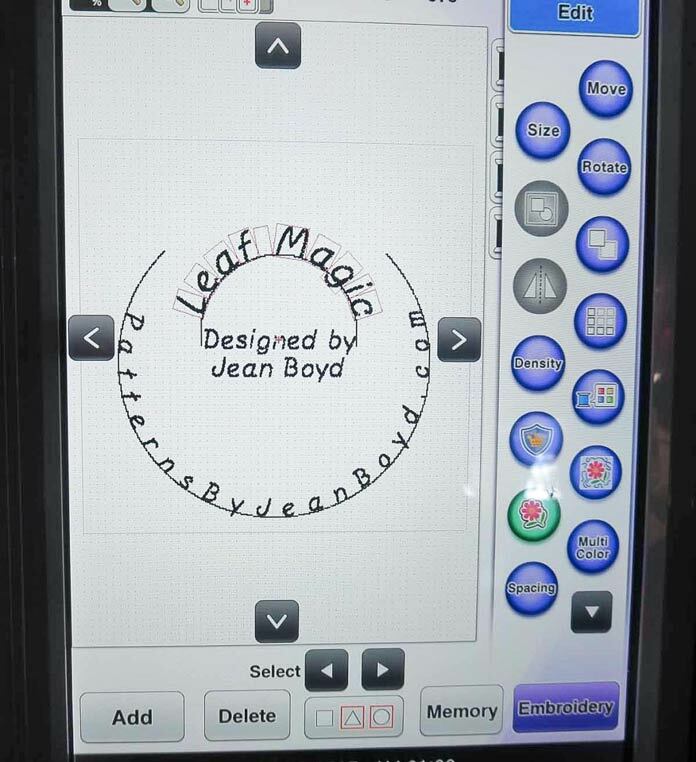 Here’s a great little video that shows you how you can write your own personal message, scan it into the machine and then use it to create an embroidered label or other project. 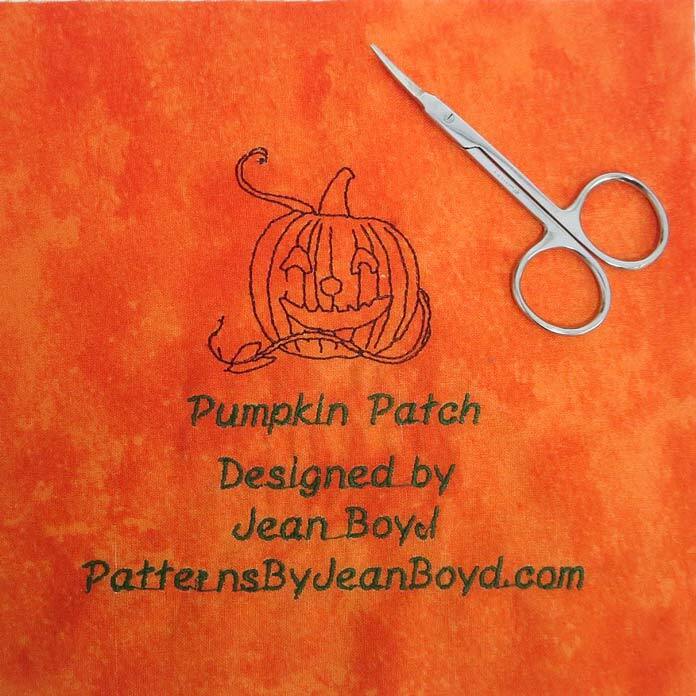 Here’s the label I created for the Halloween quilt that I showed you in yesterday’s blog post. The small manicure scissors are just right for removing the little jump stitches that are between the letters! 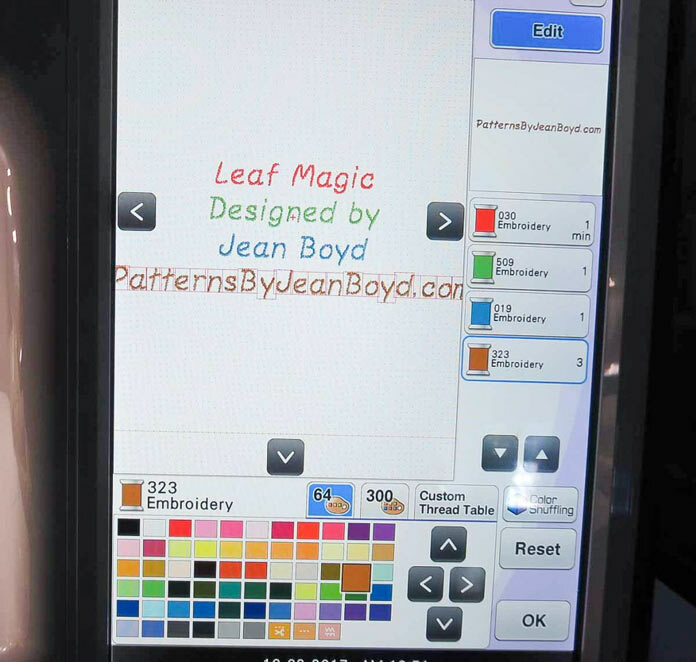 Be sure to come back tomorrow and I’ll show you some sources for embroidery patterns for THE Dream Machine 2 that you maybe haven’t thought of yet!